CLASS 3A TRACK AND FIELD: A Repeat for Norton's Boys and Beloit's Girls? Just in case you missed a couple of historic team titles in Class 3A track and field last year, don't worry: You may get a repeat this year. Norton's boys and Beloit's girls had big breakthroughs at the 2016 state championships, nabbing wins that will certainly be part of their school's lore. Norton was Kansas track and field's version of the Chicago Cubs. The Bluejays won Kansas' first-ever track and field championship in 1911 - when there was just one division for all schools - and won again in 1915. That was it, a drought of 101 years for the boys' program...until last year. Norton actually tied for the state championship, scoring 48 points to share the title with Scott County, which has since moved to Class 4A. Beloit's girls one-upped Norton's boys, though, winning the first-ever state championship for their school's girls program. (Beloit's boys have won four times.) Beloit dominated the 3A girls chase, scoring 71 points for a 26 point win over Russell. Both teams apparently are pretty good at this state championship stuff as they seem to be the early favorites to repeat as champions. Norton junior Jace Ruder returns as a title contender in three events: the discus, 300 hurdles and 100 hurdles. Junior teammate Tevin Petrie is one of the division's best in the triple jump and sophomore middle distance runner Tyus Henson should score points at state, as well. The Bluejays seem to have the best depth returning among other title contenders, namely Hoisington, Halstead, Ellsworth and Hugoton. The top returners for Hoisington include senior Johnathon Ball and junior Christopher Ball in the pole vault; and Johnathon Ball in both hurdling events. Halstead's strength lies in the distance events, where state medalists Patrick Porch and Steven Cline are back for their senior year. Ellsworth senior sprinter Kaden Davis could win three events. He won the 200 meters a year ago, and should be right in the mix in the 100 and 400 this year. Junior Darrel Gustin was fourth in the discus last year, and has the second-best mark heading into the 2017 season. Hugoton, a 4A school last year, is thus far an unknown. The school won the cross country state title in the fall, so the distance events may turn out to be a strength, led by senior Miguel Martinez and junior Abraham Garcia. They'll also likely score big points in the 400 with junior Mitchell Hamlin and Pedro Ordonez, and in the high jump with junior Tony Kinser (third in class 4A last year). The returning state champions in class 3A boys include Ellsworth's Davis in the 200; Nemaha Central senior Jacob Koelzer in the 100 and long jump; Scott County sophomore Jack Thomas in the 3200; Cimarron senior Nicholas Ast in the 110 hurdles; and Royal Valley senior Lucas Broxterman in the high jump. Beloit's girls are capable of scoring state points on the track and in the field. The squad's depth is outstanding, led by senior Kourtni Hubert (the defending state champ in the javelin) and junior Sydney Johnson (the defending state champ in the discus). Hubert and Johnson are also two of the best in the girl's shot put, and could likely put 30 points or more on the board toward a state title repeat. Beloit senior Mackenzie Vanpelt and sophomore Blaise Spangler should score state points in the pole vault, and the distance crew is headed by freshman Hannah Burks, who was third in the state cross country meet last fall. Nemaha Central has depth to challenge Beloit, with senior Kaley Dalinghaus and sophomore Jacy Dalinghaus each in three throwing events. Junior Allison Rottinghaus can contend for state titles in the triple jump and long jump. Three other early contenders are highlighted by multi-event standouts. Russell has senior Alaina Gfeller (400 meters, triple jump and long jump); Garden Plain has senior Emerson Tice (100, 200 and 400), and Sterling has sophomore Ashlyn Kelley (100, 200 and 400). The wild card right now is 2015 state champion Silver Lake, which placed sixth last year but will get a big lift this year with the return of senior Alex Ferguson, who was unable to compete last year due to a knee injury suffered while playing volleyball. Ferguson, who signed this week to run track and field at Kansas State University, won state championships in the 400 meter run in 2014 and 2015, adding the 800 meter title in 2015. She has won 14 of 15 400 meter races she has run in her high school career, placing third at the Kansas Relays in 2015. If Ferguson is back to full strength, Silver Lake is probably back in the team race. 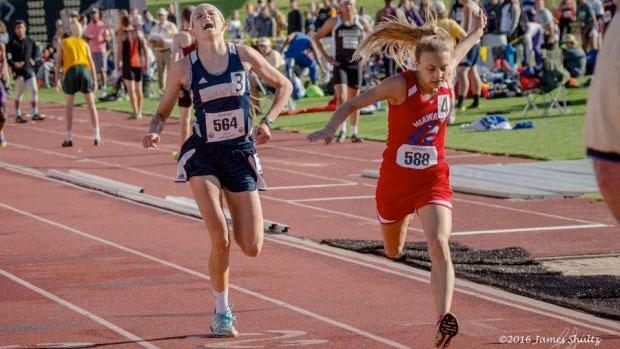 The returning state champions in Class 3A girls this year include Garden Plain's Tice in the 400; Hiawatha sophomore Elizabeth Kettler (pictured above) in the 3200; Marysville junior Grace Stohs in the pole vault; Nemaha Central's Rottinghaus in the triple jump; Russell's Gfeller in the long jump; and Beloit's Johnson in the discus.